This Paleo Butternut Squash Soup is Whole30, vegan, and naturally gluten/dairy free. Made in one pot in under an hour – it’s easy + delicious! Is there anything more delicious and cozy than butternut squash soup? This easy paleo butternut squash soup recipe is a staple in our home during the fall. Made with only a few ingredients – it’s quick to make and so tasty! This paleo butternut squash soup is naturally gluten free, dairy free, whole30 friendly and vegan! 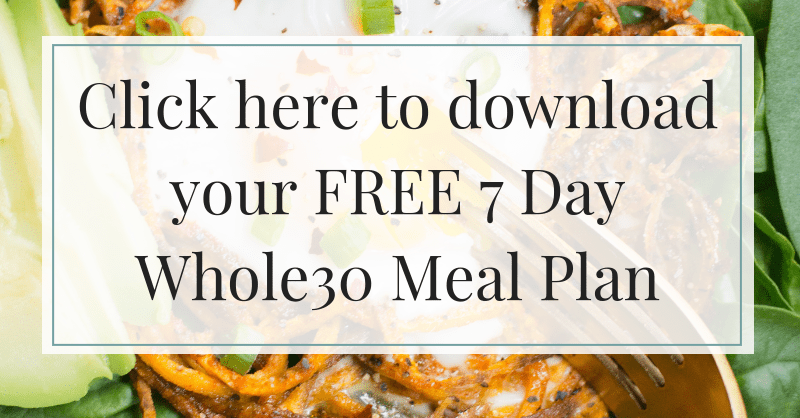 Before we get started… did you know I have a FREE 7 Day Whole30 Meal Plan? Click here for the details! Making butternut squash soup isn’t hard at all! This healthy butternut squash soup comes to just one pan. Step 1: Heat olive oil in a pan over medium high heat. Sauté squash, carrots, onions + garlic until slightly browned + soft on edges. Step 2. Add your spices, fill with stock + bring to a boil. Once boiling, reduce heat and simmer for 30-40 minutes. Step 3: Allow soup to cook + blend it up! My Vitamix always gets jobs like this done in no time! That’s literally it… it doesn’t get any easier than that! Can you make this Paleo Butternut Squash Soup in your crockpot? Yes you can! If you’d like to make this in your crockpot, I’d recommend following step one, then adding all ingredients to the crockpot + cooking on low. Why is this Butternut Squash Soup Made without milk? Because it doesn’t need it 🙂 Once you try this, you won’t even miss the milk. The creaminess of the squash + veggies when blended tastes just like soup that has milk in it. You really don’t need it! What can you serve this butternut squash soup recipe with? This Paleo Butternut Squash Soup is Whole30, vegan, and naturally gluten/dairy free. Made in one pot in under an hour - it's easy + delicious! Add stock and spices to the pan. Bring to a boil. Once boiling, reduce heat + simmer for 30-40 minutes. Allow soup to cool + add to a blender. Blend until smooth. Yes you can! If you'd like to make this in your crockpot, I'd recommend following step one, then adding all ingredients to the crockpot + cooking on low. Because it doesn't need it 🙂 Once you try this, you won't even miss the milk. The creaminess of the squash + veggies when blended tastes just like soup that has milk in it. You really don't need it! Get the nutritional facts for this recipe here. there isn’t cream in this. So glad you liked it, Deb! Made this the other night and was surprised at how easy it was. Have been enjoying it for lunch all week. Really yummy! So perfect for cold winter night! Another amazing recipe.